Explore Castine Maine during your visit at the Castine Inn, a Maine Inn offering quality lodging in historic Castine Maine on the Maine Coast near Acadia National Park and Mount Desert Island. Fort Madison -- Only the grass bunkers still exist from this fort built at the beginning of the nineteenth century, but its location at the mouth of the harbor makes it a great place to watch boats coming and going from the bay and to enjoy a picnic lunch. Dyces Head Lighthouse -- The recently restored lighthouse tower is not open to the public and the keeper’s house is privately occupied, but there is a public path across the property that takes you through the woods, down the steps and out onto the rocks at the point -- a great view, especially at sunset. Witherle Woods -- Walking paths and Indian trails wind through this wooded area on the edge of the village providing a cool respite on warm summer days. The Microburst of ’08 took a toll on the woods but efforts are underway to remove deadfall and reopen paths that might be blocked. Check at our front desk for a map of the woods. Backshore Beach -- This short stretch of rocks, sand and shells at the edge of Wadsworth Cove is the perfect spot for a bracing ocean swim, a picnic lunch, a nap in the sun or a walk around to Elephant Rock at low tide. Kayaks and canoes can be easily launched here and it’s a favorite place among windsurfers. Sunsets are spectacular. Just across the road is Castine’s swimming pool -- really more of a swimming “hole” than a pool, it is tidally fed, mud-bottomed, slightly warmer than the ocean, deep enough to swim in but not too deep, and a great spot for kids with rubber rafts and inner tubes. Town Common -- Located on Court Street about two blocks from the Inn, Castine’s common is the quintessential New England village center. It is the site of several private homes, most dating to the early 1800’s; Witherle Memorial Library; the Unitarian Church with its Bullfinch steeple and Revere bell; the Adams School where Castine children attend through 8th grade; and the Abbott School, formerly the high school and now the home of the Castine Historical Society. The square is shaded by towering elm trees rescued from Dutch elm disease, which destroyed most of this country’s American elms in the 1930s. Castine Historical Society -- The Abbott School was completely renovated and reopened in 1996 as the home of the Castine Historical Society. It exhibits a wide variety of Castine history and memorabilia. Of particular interest is a quilt designed for the town’s bicentennial, which depicts the history of Castine from the first French traders to modern times. A true community project, the 24-foot long quilt is the result of a full winter's work by more than 40 local women. A small gift shop is staffed by Historical Society volunteers. TS State of Maine -- An imposing presence at the town dock, the State of Maine is a 500-foot naval research ship recommissioned as the training vessel for the local Maine Maritime Academy. Once it returns from its annual spring cruise around July 4th, it is open to visitors until the end of August when the fall school term begins. Midshipmen give 30-minute tours each weekday. Golf and Tennis Golf - 207-326-8844, Tennis - 207-326-9548 -- The Castine Golf Club at the top of Main Street has a challenging nine-hole course (some of the holes are part of the original course designed in 1897), and four clay tennis courts. It’s best to call ahead for course availability or to reserve a court. Lessons and rental equipment are available. 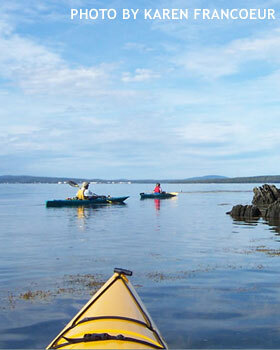 Cycling and Kayaking 207-866-3506 -- Castine Kayak Adventures offers full-day and half-day kayak tours, sunrise and sunset paddles as well as special kayaking packages by prior arrangement. All tours leave from the dock at Eaton’s Boatyard. Kayaks are available for rent by experienced paddlers. Also 21-speed mountain bikes are available to rent by the day, half day or by the week. Harbor Tours 207-701-1421 -- The classic wooden yacht Guildive offers two-hour sailings out of Castine. Learn about local marine ecology and wildlife, marine history and tradition, or simply enjoy the scenery. A typical cruise includes a combination of motoring and sailing, depending on the wind. Hospitality always includes refreshments and you may bring your own beer or wine. For more information: www.guildivecruises.com. Shopping -- Castine offers limited opportunities for shopping, but the quality of its few shops is unique. Just up the hill from the harbor, Gallery B 213-839-0851 offers a variety of local art, ranging from jewelry to bronze sculptures to wall art. There truly is something for everyone. The Compass Rose Bookstore 207-326-9366 carries a large collection of children’s titles, summer reading, bestsellers, newspapers, and nautical works creatively displayed to encourage browsing. The shop also offers tea, coffee and light homemade snacks. CW Hooke and Co 207-326-5060, purveyor of fine vices, provides goods that are meant to be irresistible to drink, eat or smoke! You will also find an assortment of local Maine products. 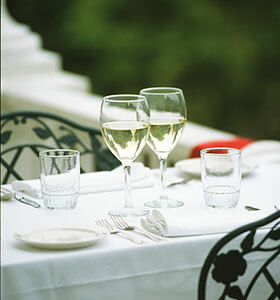 Lunch -- We do not serve lunch but if you are in town at midday, a short walk from the Inn finds several good choices. Lunch outside is a must on sunny days. Get a lobster roll at Castine Variety Store, followed by ice cream at The Breeze. Sample the freshly made salads, soups, sandwiches or sweets at MarKel’s Bakehouse. Try the crab rolls or burgers at THe Captain’s Catch and join the locals on the town dock. Steamed mussels or fresh oysters at The Wharf give a taste of Maine and a front row seat for activity in the harbor.